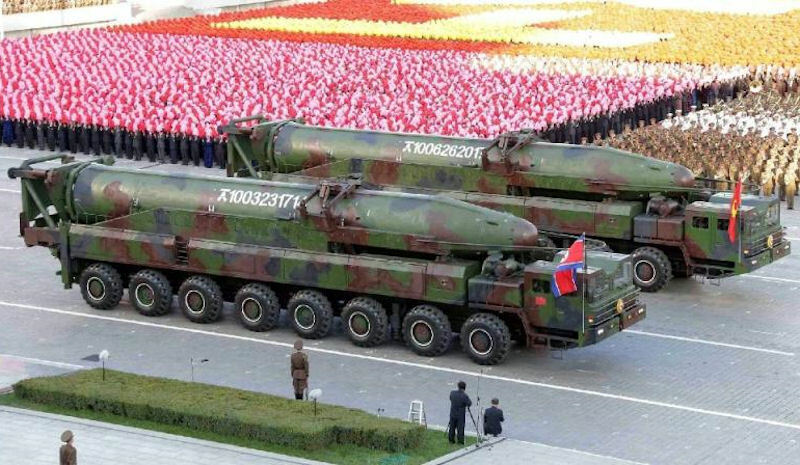 Whether you’ve been wonking on North Korea for awhile or just tuned in, chances are you’ve heard of a missile called the KN-08. You might have also heard of something called a Hwasong-13. And maybe you’ve seen a Nodong-C designation floating around online? Frustratingly, they all refer to the same missile — North Korea’s ICBM prototype first seen in 2012. Let me explain: the DPRK designates several of its missiles as “Hwasong” (화성), the Korean name for the planet Mars (literally translated as “Fire Star”) followed by a number. Pretty easy to follow. The United States, by contrast, uses a patchwork of two competing designations, one of which refers to the location where it was first tested, and the other uses a KN (Korea, North) number, in a similar style to the Hwasong convention. That’s why the Hwasong-13, the Nodong-C, and the KN-08 can all refer to the same missile — the first designation is North Korean; the latter two are American, although in this case the Nodong-C moniker is more of an online nickname than a known government designation. Aside from some outliers which break the Hwasong naming convention (looking at you, Pukkuksong-1 and -2), the DPRK has a much clearer designation system than the United States. This being said, understanding the nomenclature can be mighty confusing, as it’s supposed to be — it’s in the interests of the DPRK to keep us on our toes when it comes to their missiles programme. Jeffrey wrote a detailed post on this last year, explaining the origins of these conventions in relation to China, the USSR, and North Korea. However, as far as I’m aware, there is no complete directory of North Korean hardware as it corresponds to the KN naming convention. So I’m making one. My thanks to the Big Wonk for letting me turn my maddened scribblings into a proper blog post. In doing so I hope to fill a gap in the open-source repository, and satisfy my obsessive love for lists and nomenclature. It’s like shooting down two missiles with a single interceptor, or some other wonky maxim. My thanks go out to those who have helped corroborate some of these findings (especially Ankit Panda, who is indisputably the best source on DPRK missile designations). This post will go down the KN list from 1-21, and include references to alternate names for clarity. A couple notes — I’ve compiled this list from open-source data, which can occasionally be contradictory (for example, there is some confusion over the true identity of the KN-10, among others). I’ll try and reference these caveats where they appear, and I’ll do my best to update it as new designations are introduced. Also, this list is mainly intended as a directory, not as an encyclopedia. There’s been some excellent analysis on most of these systems already, but armed with the correct designations you’ll now KN-0w where to start looking. As reported by Ankit, the US government designates KN-01 as a ship-launched variant of the Russian Kh-35 anti-ship cruise missile, first tested in February 2015. The new ground-based tracked TEL for this system is known as the KN-19. Confusingly, The KN-01 is often identified in open-source materials as an extended range variant of the Soviet P-Termit Styx or the Chinese CSS-C-2 Silkworm ASCM. However, given that the KN system began in the mid-1990s, the Styx/Silkworm variant would be too old to warrant such a designation. The Kh-35, on the other hand, fits the timeline much better. It was first tested in 2003, and the KN-02 was first tested two years later. Jeffrey hypothesizes that somewhat vague early references to the 2003 Kh-35 test as an “anti-ship missile” led to assumptions that it was the much older Styx/Silkworm variant, which would explain the discrepancy. The KN-02 is a tactical, solid-fuel, single-stage SRBM with a range of approximately 120-220 km. Designed for precision strikes, the KN-02 is the most accurate missile in the DPRK arsenal. The KN-02 is road-mobile and is fired from a locally-constructed variant of a Belarusian MAZ-630308-224 or -243 6×4 or 6×6 commercial heavy utility truck. See CNS’ model here. There is probably an extended range version, but it isn’t clear whether it actually has a different designation. Ankit reports the KN-03 as a variant of the Nodong MRBM, although it remains unclear what sort of mod it might be. It could possibly correspond to the Nodong-1M designation which occasionally floats around online — although as of yet no hardware has been positively ID’d to match the -1M. Alternate name(s): ER-Scud, Scud-ER, Scud-D, Scud 2. The KN-05 very rarely appears in any open-source material — we needed a break after that KN-04 nonsense anyways. See my note at the end of this list relating to missing designations. 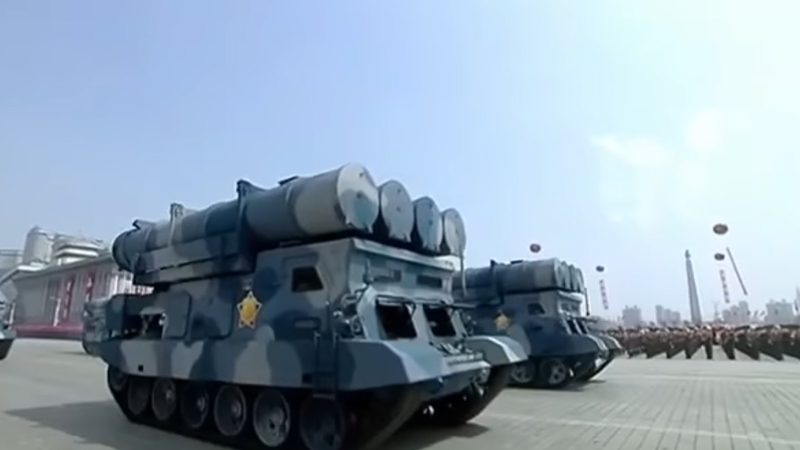 The KN-06 is a long-range surface-to-air missile first seen in a 2010 military parade. It holds a similarity to the Russian S-300 air defence system. It is launched from a TELAR — in this case a 6×6 KAMAZ truck with a linked phased array radar system. It was announced that it would be mass-produced after a test in late May 2017. Another unknown. See my note at the bottom of this list. The KN-08 is a road-mobile ICBM currently under development. Mock-ups of a three-stage version of the KN-08 were first seen in a 2012 military parade, and again in 2013. When they were displayed again in 2015, the newer mock-ups showed that the KN-08 had been shortened to two stages. This variant has been designated the KN-14. 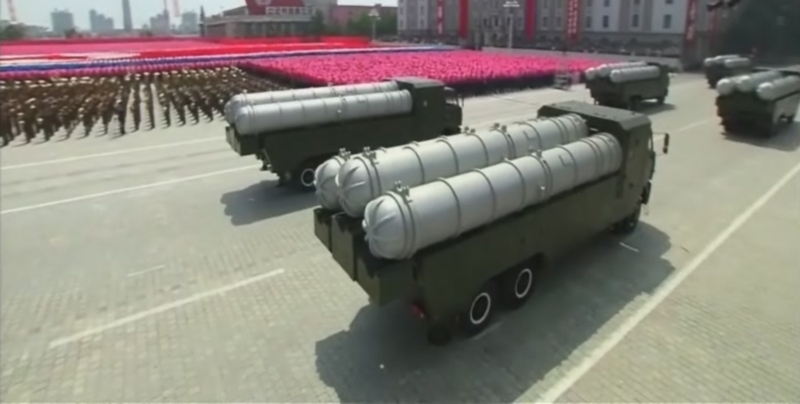 Despite initial reports that the KN-09 might be the designation for the DPRK variant of the Russian Kh-35 cruise missile launcher, it seems that the KN-09 actually refers to a 300 mm rocket artillery system. The KN-09 reportedly has a range of up to 200 km and is fired from a launcher which carries eight rockets in two pods of four. This is a tough one. The only piece of reporting I’ve seen on the KN-10 is the Wisconsin Project, which says that it’s an enhanced version of the KN-02 with a range of 220 km, first seen in an August 2014 test-firing. However, I’m a bit skeptical that an entirely new designation would be given to the same missile with slightly upgraded range. I think it’s more likely that the KN-10 refers to something else entirely — see my note at the end of this list. 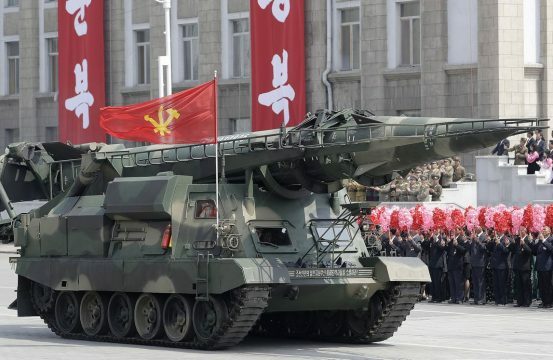 The KN-11 is the missile with the nicest paint job, by far (someone seriously needs to do a Buzzfeed-style listicle of DPRK missiles ranked by hotness). First successfully flight tested on a lofted trajectory in August 2016, the KN-11 is a two-stage, solid-fueled SLBM with range estimates between 500-2,500 km. The land-based IRBM variant of the KN-11 is known as the KN-15 (see below). See CNS’ model here. The KN-12 is a multiple rocket launcher system (MRLS) which carries forty 122 mm rockets in two banks of twenty. I’m skipping this because of superstition. And also because there is literally no open-source information on the KN-13. See my note at the end of this list. The KN-14, first seen in 2015, is the two-stage variant of the KN-08 mock-up. The shortened and simplified design led Dave Schmerler, Jeffrey Lewis, and John Schilling to estimate a range of 9,000 km with a lighter warhead of approximately 400 kg. 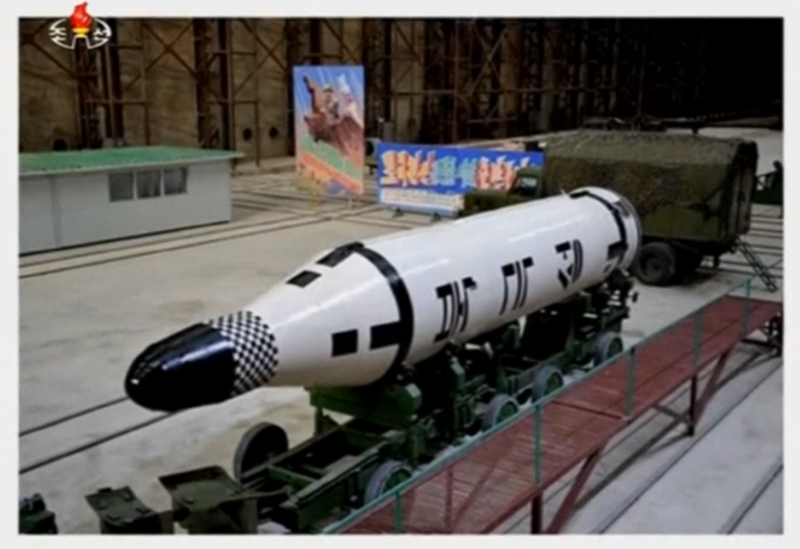 Alternate name(s): KN-08 mod 2, previously misidentified as Hwasong-14 (KN-20). The land-based variant of the KN-11 SLBM, the KN-15 is a two-stage, solid-fuelled, mobile MRBM first successfully flight tested in February 2017 from a tracked TEL. The KN-15 can be cold-launched, meaning that the missile is gas-ejected from its canister before igniting. After its second successful test in May 2017, Kim Jong-un declared that the KN-15 was ready for mass production. The KN-16 is another MRLS, this time carrying twenty-two 240 mm rockets in two banks of eleven. We saw it at #JucheFest2017 with closed canisters. The KN-17 is a liquid-fuelled IRBM first revealed at #JucheFest2017 and successfully flight tested on May 14th on a lofted trajectory. It is likely to be single-stage (although this is unconfirmed). The range is estimated as 3,700-4,500 km, and it is road-mobile, using a MAZ-based launcher similar to that used by the Musudan. The KN-18 is a single-stage, liquid-fuelled derivative of the Scud C with a maneuverable reentry vehicle (MaRV), which could be intended to evade missile defences and strike precision land targets, or potentially to target naval vessels (although this is very difficult due to ISR prohibitions). The potential for use against naval targets created some initial hype around the KN-18 as a ‘carrier-killer’ ASBM. It was also previously misreported as the KN-17, which turned out to the be Hwasong-12 (see KN-17). See CNS’ model here. The KN-19 refers to the ground-based version of the KN-01 integrated coastal defence cruise missile launcher, first tested in June 2017. The ground-based TEL was also on display at April’s #JucheFest2017, where we saw a tracked vehicle in naval camouflage carrying four missile canisters. The big one. The KN-20 is the two-stage ICBM that was tested on Independence Day, although John Schilling’s technical analysis in 38 North reveals that very little of the missile is actually new hardware. The engine is borrowed from the KN-17 and the second stage of the missile shares a number of similarities to the KN-08. David Wright’s latest estimations put the range at over 10,000 km, placing cities like Chicago, Boston, New York, and potentially Washington DC at risk. The KN-21 is a new mod of an old missile — North Korea’s first ballistic missile, in fact. 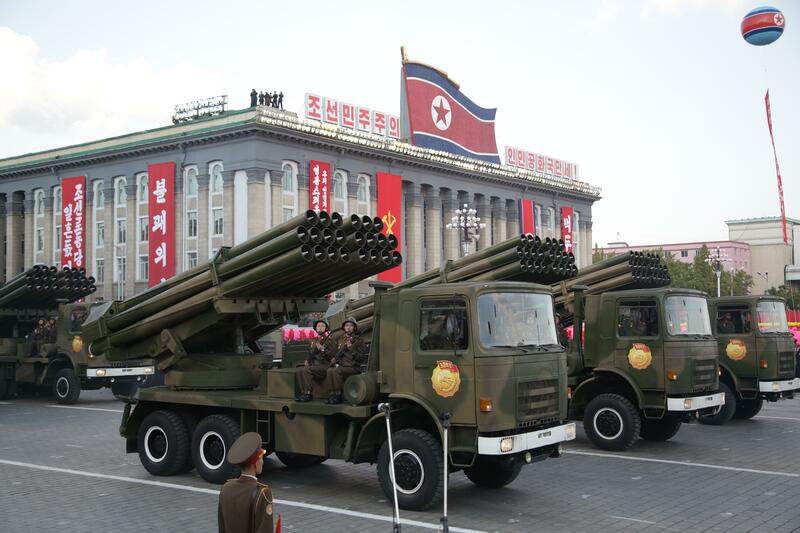 The KN-21 is a modified Scud-B (also known as the Hwasong-5) with terminal maneuverability. Ankit reports that the three missiles tested on August 26 out of Kittaeryong were KN-21s, and not KN-09s as previously assessed by South Korean intelligence. It is believed to potentially have a similar guidance system and control surfaces to the KN-18, although the KN-18 has a separating warhead, unlike the KN-21. In effect, the KN-21 is to the Scud-B what the KN-18 is to the Scud-C — a significant and parallel upgrade. I have no idea if that somewhat convoluted sentence made things any easier, but at this point I’m just happy that they didn’t call it the Scud 3. The KN-22 is North Korea’s newest ICBM, first tested in late November out of Pyongsong. First off, this missile is absolutely massive — bigger than anything we’ve seen previously, outside of the Unha/Taepodong-2. It was launched from a transporter-erector (T/E) with a detachable firing table, in similar fashion to the KN-17 and KN-19 (although this new one is 9 axles and is subsequently much larger). The missile itself is two stages (with an entirely new second stage) and can carry an RV large enough for a sizeable two-stage nuclear device with space for decoys or multiple warheads in the future. As you may have noticed, we have some KN numbers without corresponding hardware. The KN-03, -04, -05, -07, -10, and -13, to be exact. As Jeffrey noted in his post, the old location-based naming system was likely replaced by the KN system when the Americans started running out of place names in the mid-1990s. As far as I am aware, these older systems were not assigned KN numbers when the new system was introduced, so missiles like the Nodong, the Musudan, and the Taepodong do not have KN designations. The Nodong and Musudan do, however, have corresponding Hwasong designations (Hwasong-7 and -10, respectively), as per the North Korean naming convention. The Nodong, Taepodong-1, and Taepodong-2 also reportedly carry ND01, TD01, and TD02 designations. North Korea’s Scud variants (Hwasong-5 and -6) are likely to be too old for KN numbers; however, the US government doesn’t exactly have a great track record with logical naming conventions (see: the entire Cold War). The amount of DPRK hardware greatly exceeds the number of assigned KNs, so the missing numbers could correspond to pretty much anything: The Unha-3 space launch vehicle? The Pongae-6 SAM? And don’t forget we still have the DF-31 and Topol-M style canisters seen at #JucheFest2017, still unidentified. As I mentioned, this list collates data from open-source materials. If you know something I don’t, please get in touch. In the meantime, happy wonking. What are the foreign predecessors of the KN-20? Is it based on a russian missile? I was also wondering if someone knows about the max volume/shape a warhead is allowed to take? Hi Matt, the source that reported that the KN-10 is a modified version of the KN-02/SS-21 is an article in the Korea JoongAng daily from September 2014. Here is the link: http://koreajoongangdaily.joins.com/news/article/article.aspx?aid=2995221.